I see music as a way to spread a message and provide an energy and sound that I don’t really think is out there that much on a global level. If there's one thing that most people know about me, it would be that I'm a Kendrick Lamar fan. A huge one. So, I was excited when I saw an Okayplayer post on Twitter back in December about an artist that sampled Kendrick's "Chapter Six" from Section.80 and laid his own vocals and lyrics over it. Once I finished vibing to the chill production and vocals of "The Stoop," I visited his SoundCloud page and found another vibed out Kendrick Lamar and Robert Glasper mashup cover called "The Let It Ride Theory." "The Stoop" lured me in, but "The Let It Ride Theory" made me a fan. After listening to his music, I found him on Twitter, applauded him on his music, and soon after, we exchanged messages on featuring him here on Transcending Sound. It's odd to get a "sure, I'd like to!" from an artist when your readership numbers aren't on fleek yet, but it's more than appreciated and it speaks highly of him as a person. Due to conflicting schedules, we did the interview via email. Even though I didn't get to see or hear him, I felt his chill, relatable and positive energy through his words. Those words are a true reflection of his music. 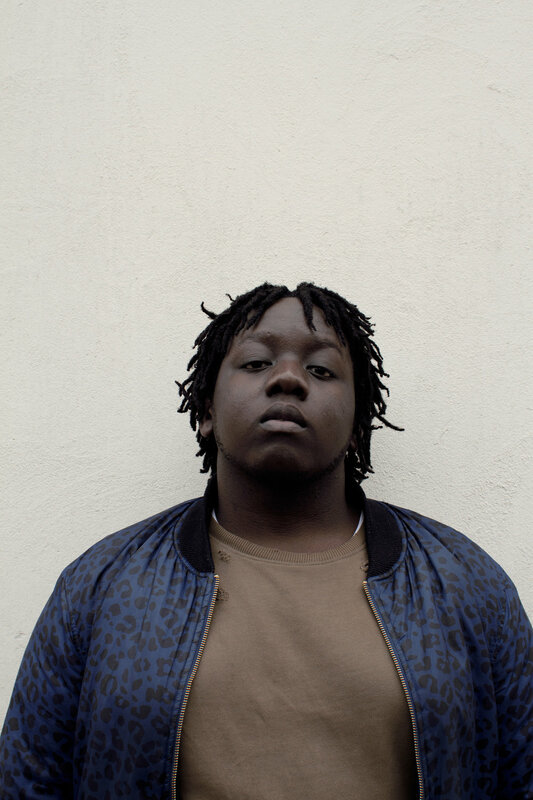 Michael Kiggundu, aka MUNDU, is an alternative R&B singer-songwriter and producer from South London. He developed his singing by participating in a choir, but went the secular route a few years ago. He also started producing his own music out of necessity: other producers weren't creating the sound that he was looking for. With music inspirations ranging from Pink Floyd to 90's hip-hop, with artists like SZA, Thundercat, and Coldplay in the middle, MUNDU tries to stay in his own lane with his music. Describing his music as "meditational but dabbable" (interestingly mentioned to him by a fan), his lyrics are introspective and his voice is gentle, but his beats are heavy yet capable to rock to. As soon as I read that, I laughed, but after listening to his debut EP, Qrush, a project created after a year-long music hiatus, it all made sense. Produced entirely by him, along with a majority of the songs written by him, Qrush is a dreamy and reflective narrative on love that feels exactly that way: meditational but dabbable. Based on our interview, I believe that MUNDU's "meditational" work is very reflective of him as a person today. Once seeking musical success as a way to get money and fame, MUNDU changed his viewpoints on why music is important to him. Being inspired by the messages of Bob Marley and Jimi Hendrix, MUNDU hopes that he can "continue the work that they’ve done and have a similar impact on the world in bringing people together on a large scale" in order to "inspire a generation to almost make peace, love and acceptance a compulsory thing in the world." "I really wanna spread a message of peace, love and acceptance, be it directly or indirectly." MUNDU plans on continuing the inspiration with his second EP, Qollapse, which he plans to release in June of 2016, the one year anniversary of Qrush. His goal with creating Qollapse was not only to expand on his craft and sound, but to "document how it feels to fall through the energies of the songs and not necessarily through the words and content." With its summer release, Qollapse should be a reflection of the season, with the goal of getting people out and about to enjoy life together, instead of being alone and miserable. But, until Qollapse, we have the opportunity to get ready for the summer with "Campfire," the first single from the EP. "Campfire" is all about finding a release from the hustle and bustle of the world by taking the time out to have pure, simple fun, just like kids do. The lyrics, along with the song's electronic, R&B, hip-hop and even a bit of a Caribbean feel, gives me a sense of nostalgia, an experience that I want to enjoy again. "Campfire" will make you at least nod your head, if not dab or do a mean two-step, because it feels good, just like the summer. It feels like freedom, like an ascension of sorts, which is something that MUNDU wants more of in his music. Hopefully, with that elevation, he will go far, and remain himself in the process "by making the music that’s most true to [him] as a person and as an energy." Find MUNDU on Facebook, Twitter, Instagram, YouTube and SoundCloud.